With Adivi Sesh and Adah Sharma as leads, a Telugu thriller Kshanam has hit the big-screens today with much publicity. Let’s see how the movie fares with Kshanam Movie Review on Firstshowz.com Adivi Sesh of Panjaa and Baahubali fame is playing the lead role as investment banker, who comes to India from San Francisco in search of a missing girl, while Adah Sharma plays his ex-girlfriend. Anasuya is playing other central role. Sesh Adivi is quite confident and says that the climax twist in the film is the biggest asset of the movie, besides the plot and the technical values. Debutant Ravikanth Perepu donned the director cap for the movie while PVP Cinemas produced Kshanam. Satyam Rajesh and Vennela Kishore played supporting roles. Check below for Kshanam Film Rating..
An investment banker Rishi (Adivi Sesh) settled in US gets a surprise call from his ex girlfriend Swetha (Adah Sharma) one day asking him for his help. Rishi flies to India to help Swetha and learns about Swetha’s missing daughter Ria two months back. How does Rishi solve the case and what problems does he face in dealing mystery forms rest of Kshanam. Adivi Sesh is evolving as an actor with each of his films, and he is brilliant in Kshanam. He has a good screen presence and carries of the film on his shoulders, delivering an emotional performance. Kshanam is a film he can be proud of. Adah Sharma bags a meaty role and performs well in the full-length emotional role. It is one of the best roles unlike her regular glamorous roles. She shares good chemistry with Adivi Sesh. Anasuya is confident and convincing in the role of a cop. Satyam Rajesh as a frustrated cop is another major asset for the movie. His acting capabilities make you surprised in this movie. Satya Dev is justifying. Others including Vennela Kishore, Satya, Ravi Varma were adequate. Cinematography is brilliant and keeps you glued, while Sricharan Pakala’s background score elevates the proceedings. The songs are shot well and gel with the film’s theme. Ravikanth Perepu’s direction is gripping and impressive. He has done a fabulous job for this thriller, despite being a debutant. Screenplay however has some hiccups, while editing is slick and crisp. Production values of PVP house are rich. Kshanam as promoted is a thriller with a unique plot and gripping execution. The racy narration with hard hitting twists and thrills deserves applause to the team of Kshanam. The cast are perfect and delivered some terrific performances, while the technicians did a brilliant job. Director Ravikanth Perepu made the film racy maintaining the suspense factor throughout. The interval bang is brilliant and the second half is engaging. However, on the flip side some of the twists were not convincingly cleared and the climax could have been dealt well with an emotional touch. The film is certainly not for commercial routine movie lovers who are looking for entertainment, but it’s an intense and engaging thriller, which is definitely worth a watch. 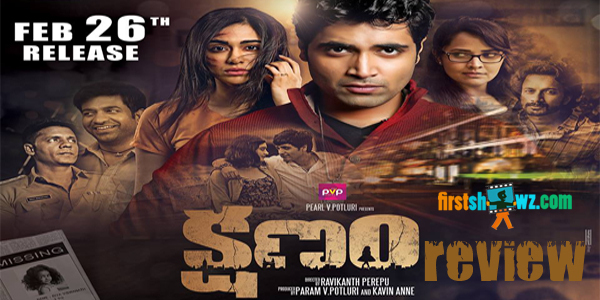 Kshanam- This Thriller makes you glued to screens!